Context Misdiagnoses may be an underappreciated cause of preventable morbidity and mortality in the intensive care unit (ICU). Their prevalence, nature, and impact remain largely unknown. Objectives To determine whether potentially fatal ICU misdiagnoses would be more common than in the general inpatient population (∼5%), and would involve more infections or vascular events. Data sources Systematic review of studies identified by electronic (MEDLINE, etc.) and manual searches (references in eligible articles) without language restriction (1966 through 2011). Study selection and data abstraction Observational studies examining autopsy-confirmed diagnostic errors in the adult ICU were included. Studies analysing misdiagnosis of one specific disease were excluded. Study results (autopsy rate, misdiagnosis prevalence, Goldman error class, diseases misdiagnosed) were abstracted and descriptive statistics calculated. We modelled the prevalence of Class I (potentially lethal) misdiagnoses as a non-linear function of the autopsy rate. Results Of 276 screened abstracts, 31 studies describing 5863 autopsies (median rate 43%) were analysed. The prevalence of misdiagnoses ranged from 5.5%–100% with 28% of autopsies reporting at least one misdiagnosis and 8% identifying a Class I diagnostic error. The projected prevalence of Class I misdiagnoses for a hypothetical autopsy rate of 100% was 6.3% (95% CI 4.0% to 7.5%). Vascular events and infections were the leading lethal misdiagnoses (41% each). The most common individual Class I misdiagnoses were PE, MI, pneumonia, and aspergillosis. Conclusions Our data suggest that as many as 40 500 adult patients in an ICU in USA may die with an ICU misdiagnoses annually. Despite this, diagnostic errors receive relatively little attention and research funding. Future studies should seek to prospectively measure the prevalence and impact of diagnostic errors and potential strategies to reduce them. A 2003 systematic review of autopsy-confirmed misdiagnoses found that 9% were Class I errors and 15% were Class II errors.5 After adjusting for declining autopsy rates over time, the authors estimated that 10% of all hospital deaths had a major diagnostic error and 5% of these were Class I errors. They also estimated that the Class I error prevalence in the ICU population was twice the overall prevalence in US hospitals. Nevertheless, the prevalence of diagnostic errors, the conditions ultimately diagnosed and the degree of harm from these errors are largely unknown. The methods to measure diagnostic errors are underdeveloped and most studies measuring patient safety ignore diagnostic errors.1 In a recent study for example, diagnostic error was not a variable in examining temporal changes in patient harm over time.6 As such, the problem of diagnostic errors remains largely invisible. The purpose of this study was to systematically estimate the prevalence and distribution of autopsy-confirmed diagnostic errors in the ICU population. We hypothesised that diagnostic errors would be more common in the ICU population than previously reported for the general hospital population. Additionally, based on a preliminary assessment of the literature, we hypothesised that most errors identified related to infections or vascular events. 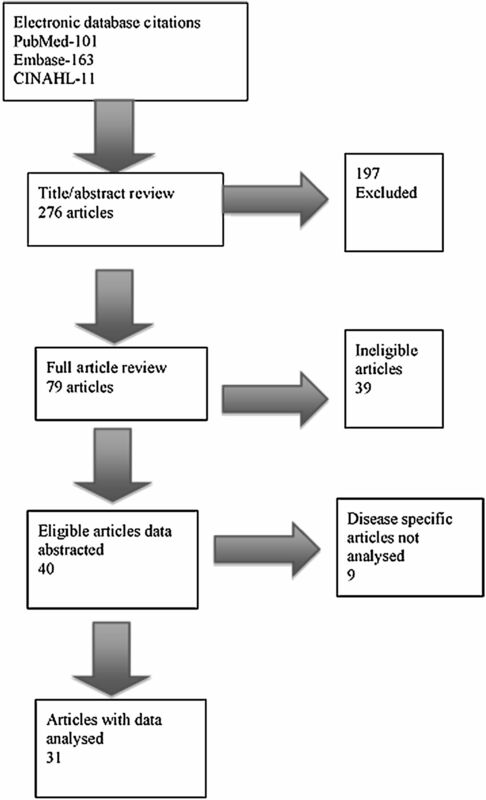 We conducted a systematic review of the published literature from 1966 through 2011 for observational studies that examined the prevalence of potentially lethal diagnostic errors in the ICU, as diagnosed by the reference standard of autopsy. Databases searched included PubMed, Embase, Cumulative Index to Nursing and Allied Health Literature, and the Cochrane Database of Systematic Reviews using the Johns Hopkins Welch Medical Library online electronic resources. There were no language limitations. The full search strategies (see online appendix) were designed by librarians from the Johns Hopkins Welch Medical Library (KR, VG) together with clinical investigators (BW, DNT). All of the clinical investigators that served as reviewers have expertise in critical care or evaluation of diagnostic errors. Two reviewers (JC and SGK) independently screened each abstract and all studies considered eligible by either reviewer were passed on to two reviewers (JC and BW) for a full article review to determine inclusion in the final analysis. Disagreements between these reviewers were resolved by group consensus. Bibliographies from retrieved articles were screened for other relevant studies; none were identified. We did not attempt to contact authors or identify meeting abstracts, unpublished studies, or other grey literature. We included studies if they provided autopsy-confirmed misdiagnosis data on adult patients who died while in an intensive care setting. Studies without original patient data were excluded. We did not set standards for autopsy performance or for conduct and reporting of individual studies (eg, prospective vs retrospective). Two types of studies were defined: (1) general misdiagnosis studies (reporting on all misdiagnoses or all misdiagnoses of a minimum severity),7–37 and (2) disease-specific studies (reporting only on misdiagnoses of particular conditions, such as pulmonary embolus).38–46 We excluded disease-specific studies from our analysis. A flowchart of our study selection is in figure 1. This figure shows the study selection flowchart. Four authors (JC, BW, AN, SMG) reviewed the general misdiagnosis studies and abstracted the data for pooled analysis. These data included number of deaths, autopsies and errors, error class, underlying diagnoses, country and ICU type. We did not assign a quality rating. Errors were defined by the Goldman Classification scheme. Class I are missed major diagnoses with potential adverse impact on survival and that would have changed management. Class II is a missed major diagnosis that would not have impacted survival and that would not have changed therapy. Class III and Class IV are minor errors related to the terminal disease but not death and completely unrelated to either, respectively. The majority of studies reported Class I7–16 18–32 34–37 and II7 ,9 ,10 ,12 ,13 ,15 ,16 ,18–32 34–36 error data, and less reported Class III9 ,10 ,12 ,13 ,15 ,16 ,18–20 ,22 ,26 ,30 ,31 and IV9 ,12 ,13 ,16 ,18 ,20 ,23 error data. We defined four broad disease categories to assess the distribution of types of misdiagnoses. These categories included: (1) vascular (myocardial infarction, pulmonary embolus, stroke, any organ infarct, any vessel rupture or dissection, and any haemorrhage), (2) infectious (bacterial, aspergillosis, other fungal, viral, and tuberculosis), (3) mechanical pathophysiological states (cardiac tamponade, bowel obstruction, perforated viscus, congestive heart failure, and cardiac valve failure), and (4) neoplastic/other. Some studies treated pneumonia and aspergillosis separately from other infections.10 ,14 ,19 ,20 ,25 ,34 We aggregated these results during the analytic phase. Data were tabulated using Microsoft Excel 2008 for Mac (Microsoft Corp., Redmond, Washington, USA). Descriptive statistics were calculated using Stata V.11 (Stata Corp., College Station). A p value <0.05 was considered statistically significant. A logistic regression model was performed to create a hypothetical prediction of the prevalence of misdiagnoses at higher autopsy rates to predict what the actual error rate might be if every patient who died in an ICU always had an autopsy. A random intercept logistic regression model was fit to the class I misdiagnosis rate (number of class I errors vs number of autopsies performed) as a non-linear function of the per cent of autopsies performed (natural spline with two degrees of freedom). A likelihood ratio test was performed with R V.2.11.1 (R Foundation for Statistical Computing, Vienna, Austria) to determine if the non-linear function was justified over a linear fit. The random intercept was included to account for natural variation across studies as is standard in meta-analysis. We controlled for size of study (number of autopsies) and the study time period in this model. Of 276 abstracts screened, 78 were advanced to full article review (κ for concordance was 0.97; SE =0.11). We identified 41 studies and subsequently excluded one by group consensus because the unit studied could not be clearly identified as an ICU. Of the remaining 40 studies, 30 reported general misdiagnosis (28 retrospective) representing a total of 5863 autopsies and were included in our analysis, and nine were disease-specific misdiagnosis and excluded from our analysis (tables 1 and 2). The study periods ranged from 11 months to 300 months and included a wide range of ICU types. Autopsy rates ranged from 6% to 100% (weighted mean 41%, median 43%). The prevalence of autopsy-detected misdiagnoses ranged from 5.5% to 100%. In aggregate, 28% (n=1632/5863) of autopsies reported at least one misdiagnosis (figure 2). Of the 31 studies, 27 reported class I error data, 25 class II, 13 class III, and 7 class IV error data. Class I diagnostic errors were identified in 8% (n=343/4514); Class II errors in 15% (n=637/4403); Class III errors in 15% (n=264/1711); and Class IV errors in 21% (n=175/816) of autopsies reporting (figure 2). Class I misdiagnoses were less prevalent at higher autopsy rates (figure 3) although total misdiagnoses were not (data not shown). The predicted prevalence of potentially lethal misdiagnoses, when extrapolated to a hypothetical ‘perfect’ 100% autopsy rate was 6.3% (95% CI=4.0% to 7.5%). Our model estimates the Class I error prevalence as a function of autopsy rate; the model result (6.3%) differs from the measured prevalence (8%), which is simply the average misdiagnosis prevalence from all autopsies reporting Class I errors. A likelihood ratio test was used to determine if the non-linear function was justified over a linear fit (p=0.021). In addition, a likelihood ratio test was used to determine if the autopsy rate (based on natural spline fit) provided any information for the class I misdiagnosis rate (p=0.002). After accounting for the autopsy rate, the estimated SD of the log odds of a class 1 misdiagnosis across studies was 0.58 (SE: 0.11), translating to study to study variation accounting for roughly 10% of the total variation. This figure shows the proportion of all autopsies that identified a misdiagnosis, and the proportion of autopsies that identified a misdiagnosis stratified by the Goldman criterion (Class I, II, III, and IV). The grey bars represent identified misdiagnosis and the black bars represent all autopsies reported for total and class. Of the 30 studies included in this analysis, 26 reported class I error data, 24 class II, 13 class III, and 7 class IV error data. Thus, the sample sizes by Goldman classification varied. Stratified by class, 8% of autopsies detected a Class I error, 15% detected a Class II error, 15% detected a Class III error, and 21% detected a Class IV error. 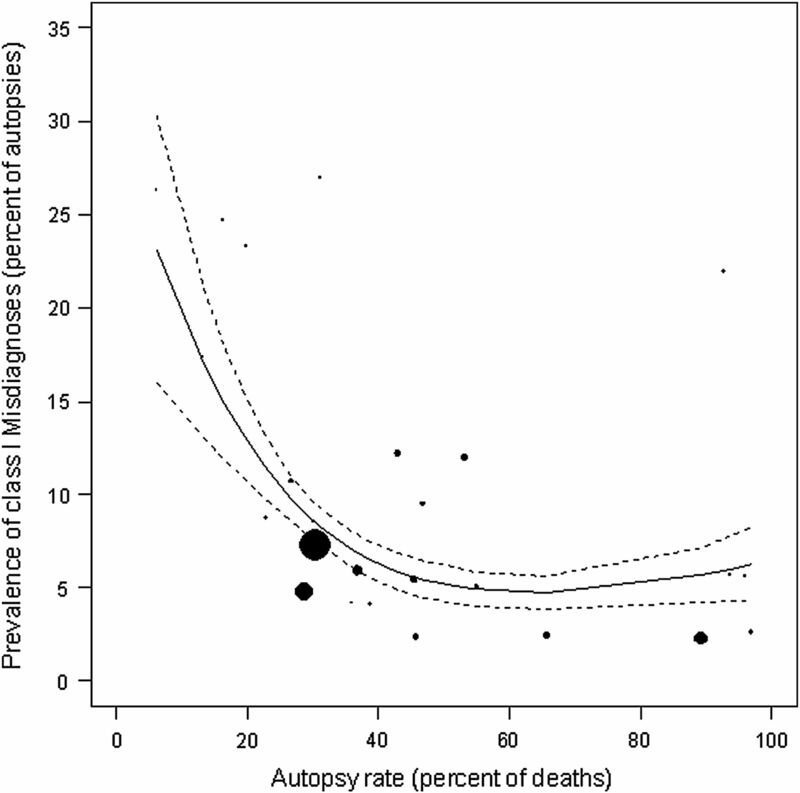 This figure illustrates the prevalence of Class I misdiagnoses (as a per cent of autopsies) and the autopsy rate. Each point on the figure represents data from one study. The plotting symbols are proportional to the number of autopsies performed in each study (with larger plotting symbols indicating larger number of autopsies). The solid line represents the logistic regression models estimate for reported values. The dotted lines represent the 95% CIs. The curve was generated using a natural spline with two degrees of freedom. Final diagnoses were provided in 25 of 31 studies for Class I misdiagnoses and in 16 of 31 studies for Class II misdiagnoses (figure 4 and box 1). Among all Class I errors, vascular events (41%) and infections (41%) were the most common diagnosis, followed by mechanical pathophysiological states (10%), and neoplasms and other conditions (9%). For all Class II errors, vascular events (47%) were the most common diagnosis, followed by infections (29%), neoplasms and other conditions (21%), and mechanical obstructive pathophysiological conditions (4%). Within these broad categories, pulmonary embolus, myocardial infarction, pneumonia, and aspergillosis were the most common diagnoses in the class I errors. Cumulatively, they accounted for about one-third of all potentially lethal diagnostic errors (box 1). This figure shows the most common misdiagnoses by broad disease categories for Class I and II errors. These categories are vascular (myocardial infarction, pulmonary embolus, stroke, any organ infarct, any vessel rupture or dissection, and any haemorrhage), infectious (bacterial, aspergillosis, other fungal, viral and tuberculosis), mechanical pathophysiological states (cardiac tamponade, bowel obstruction, perforated viscus, congestive heart failure and cardiac valve failure), and neoplasm and other (includes acute respiratory distress syndrome (ARDS)). 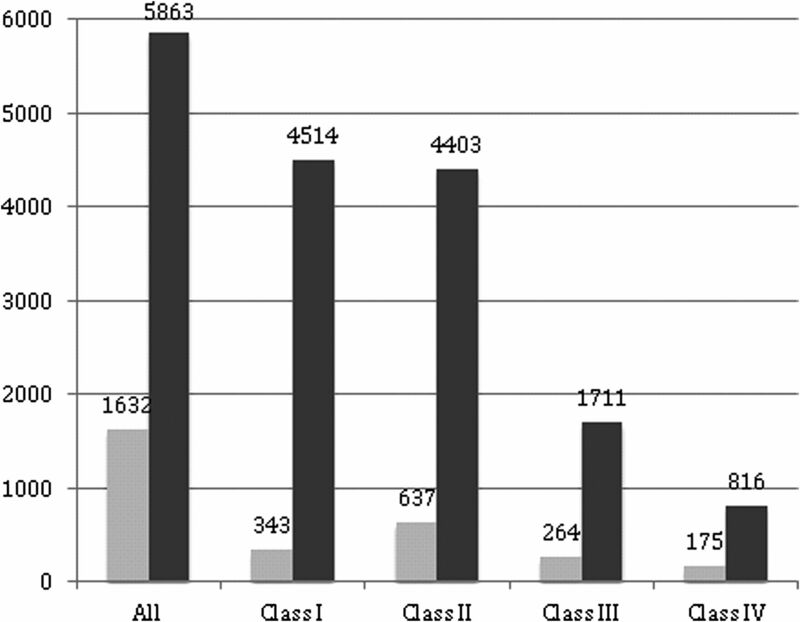 The number of Class I (black bar) and Class II (grey bar) errors are compared for each diagnostic category. The data for Class I errors represents 24 of the 30 studies in the analysis and data for Class II errors represents 16 of 30 studies. Values in parentheses are the actual total number of class I and class II identified in studies reporting this data. In this study, 28% of autopsied ICU patients had at least one misdiagnosis. Of the autopsies reporting misdiagnosis error classifications, 8% were Class I (major and potentially lethal), and 15% were Class II (major but not lethal) despite presumably aggressive diagnostic assessment in the critical care environment. Given the 540 000 deaths annually during or immediately following an ICU stay,48 and extrapolating to a 100% autopsy rate, our findings suggest that 34 000 (95% CI =22 600 to 40 500) ICU patients in the US may die as a result of a Class I error annually, assuming that the error was the cause of death. This predicted number is comparable to the estimated deaths from central line-associated bloodstream infections in the ICU49 and from breast cancer50 in the US, and does not consider misdiagnosis-related morbidity among intensive care patients. These results also suggest that despite the dropping autopsy rate over time, autopsy remains a crucial asset especially in ICU patients. We proved our hypothesis that infections and vascular events would culminate a large majority of the diagnostic errors. Vascular events and infections were the leading potentially lethal misdiagnoses accounting for almost 82% of potentially lethal Class I errors and almost 76% of the serious but not lethal Class II errors. Neoplastic disease was the third most common overall misdiagnosis category but was rarely deemed lethal. Mechanical pathophysiological states were uncommon. Importantly, pulmonary embolus, myocardial infarction, pneumonia, and aspergillosis accounted for over one-third of all Class I misdiagnoses. These four particular diagnostic errors may be useful as outcome measure for designing early interventions to reduce diagnostic errors as a whole. Observed diagnostic error frequencies were highest in studies with the lowest autopsy rates. Clinical selection of the most complex cases to undergo autopsy is believed to contribute to this effect.51 To counter this effect, we have modelled the measured error frequency as a function of autopsy rate, controlled for study size and time and extrapolated out to conditions of 100% autopsy. Nevertheless, it is possible that other factors may contribute to the difference seen in studies with low autopsy rates such as a more detailed and rigorous approach to autopsy and error finding. Additionally, the level of diagnostic certainty as to the cause of death is likely to influence the autopsy rate. Podbregar et al 27 attempted to measure this influence finding that diagnostic certainty significantly influenced the decision to pursue an autopsy though there were no differences in the class I error rate. As a consequence, our extrapolated estimate for the total error frequency likely represents a conservative, minimum estimate of the true frequency as aggregated from the present data. Although we could not measure morbidity associated with misdiagnosis in survivors, the consequences and costs are likely substantial. ICU-based studies have reported complications of misdiagnosis, such as re-operation,52 and increased length of stay.53 The most frequently reported non-lethal long-term consequences of misdiagnosis are neurological. Preventable or treatable neurological complications of critical illness such as stroke may go unrecognised with devastating consequences.54–56 Robust estimates of the morbid consequences of diagnostic errors will likely require prospective studies. Risk predictors for misdiagnosis in the ICU at the patient, organisational or provider level are incompletely defined and there is sparse data on root causes of misdiagnosis in the ICU. Off-hours occurrence appears to be a risk factor for at least some types of ICU misdiagnosis.53 Patient demographics and institutional factors have been cited as possible influences.5 ,57 ,58 There is evidence that the patient's clinical presentation such as greater co-morbidity or illness complexity increases the risk of misdiagnosis.52 ,53 ,56 ,59 The diagnostic process is complex60 and errors may occur at any stage during the process, often at multiple stages.61 Some misdiagnoses may be directly linked to limited sensitivity and specificity of individual tests in the critical care setting,62 but remediable causes are most often associated with failures in information processing. Cognitive errors are also a major contributor to misdiagnoses and a recent review by Graber et al 63 identified a large number of possible approaches (some tested and some not) that may help reduce cognitive errors and hence, misdiagnoses. A major impediment to better understanding of diagnostic errors is the declining autopsy rate.5 The reasons for this are multi-factorial and likely include medical culture and societal attitude shifts. One alternative that might improve the rate of autopsy is the ‘virtual autopsy’ using sophisticated radiological techniques as opposed to dissection. Wichmann et al,64 recently reported a comparison of ‘virtual autopsy’ to traditional autopsy in ICU patients suggesting that it compares favourably and had a higher acceptance rate in terms of per cent of deaths referred to post-mortem analysis. With further refinement this approach may offer a way to continue to obtain the post-mortem information required. Our systematic review has significant policy implications. Diagnostic errors have not been the focus of patient safety campaigns or systematic studies.1 ,65 A 2003 report of 93 Agency for Health Research and Quality (AHRQ)-funded safety projects found only one focused on misdiagnosis.65 A recent Special Emphasis Notice has sought proposals for these errors in ambulatory and emergency department settings,66 but it has not been linked to a funded request for applications. Our review has limitations. We did not search the grey literature nor did we follow-up with authors, pursue secondary references or consult with experts and publication bias could, in theory, have inflated our measured prevalence. Virtually all studies were retrospective in nature and there is potential for selection bias in those autopsied though Podbregar et al 27 found that while diagnostic certainty did influence the rate of autopsy, it did not influence the rate of class I errors. Unfortunately, the reliability of determining whether an error occurred and its severity could not be determined to any meaningful extent in the reviewed studies. Thus our estimate of the class I (lethal) diagnostic error frequency may either be an over- or under-estimate of the true frequency. Debate continues on the extent to which this is a potential problem.11 There was some heterogeneity in the study populations included in our review and the measured misdiagnosis prevalence varied even at high autopsy rates, so misdiagnosis prevalence might not be evenly distributed. We did not assign a quality rating to the studies analysed based on autopsy confirmed diagnosis being a ‘gold standard’. Autopsy, as a ‘gold standard’, is potentially flawed as the decision to perform an autopsy or the results of the autopsy may be influenced by the degree of involvement of clinicians in the judgement of diagnostic errors, the degree to which pathologists knew the clinical history and working diagnoses at the time that they performed autopsy and the format/context in which requests for autopsy were transmitted. The original study authors may have misclassified the types of diagnostic errors, resulting in inaccurate estimates of lethality or preventability and disease frequency estimates might be distorted. Nevertheless, given the consistency with which studies reported missed infections and vascular events as a common source of lethal diagnostic errors, these are likely important. In conclusion, this systematic review and analysis suggests that between 22 600–40 500 ICU patients die each year in the US with and potentially from a diagnostic error and many more suffer a clinically relevant diagnostic error. These data suggest that diagnostic errors are a significant cause of preventable harm in hospitalised patients. To this point, diagnostic errors have received relatively little attention and research funding, leaving the methods to measure them immature; this must change. Future studies should seek to prospectively measure the prevalence and direct impact of diagnostic errors, including those that are non-lethal, and potential strategies to reduce them. The authors wish to thank Christine G. Holzmueller, BLA for her assistance in editing the manuscript.
. Diagnostic errors—the next frontier for patient safety. JAMA 2009;301:1060–2.
. Diagnostic errors in critical care settings—managing information overload. ICU Management 2009;9:6–11.
. Diagnostic error in internal medicine. Arch Intern Med 2005;165:1493–9.
. The value of autopsy in three medical eras. N Engl J Med 1983;308:1000–5.
. Changes in rates of autopsy-detected diagnostic errors over time: a systematic review. JAMA 2003;289:2849–56.
. Temporal trends in rates of patient harm resulting from medical care. N Engl J Med 2010;363:2124–34.
. Does the length of stay in the intensive care unit influence the diagnostic accuracy? A clinical-pathological study. Eur J Emerg Med 1999;6:227–31.
. Do autopsies of critically ill patients reveal important findings that were clinically undetected? Crit Care Med 1998;26:1332–6.
. Clinical and autopsy diagnoses in the intensive care unit: a prospective study. Arch Intern Med 2004;164:389–92.
. Post mortem examination in the intensive care unit: still useful? Intensive Care Med 2004;30:2080–5.
. Management of severe trauma in intensive care units and surgical wards. Med J Aust 1999;170:416–19.
. Autopsy as quality assurance in the intensive care unit. Crit Care Med 1988;16:683–5.
. The role of autopsy on patients with burns. J Burn Care Rehabil 2000;21:339–44.
. 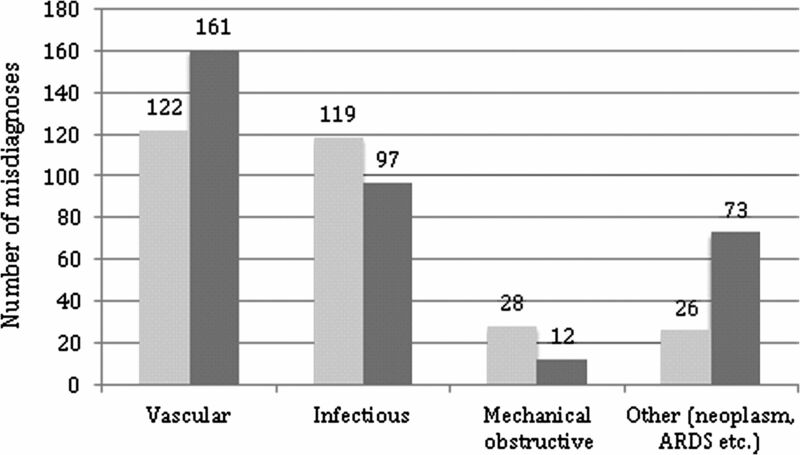 Causes of deaths in an oncologic intensive care unit: a clinical and pathological study of 34 autopsies. Eur J Cancer 1990;26:377–81.
. Autopsy: quality assurance in the ICU. Intensive Care Med 1999;25:360–3.
. Comparison of premortem clinical diagnosis and autopsy findings in patients with burns. Burns 2008;34:595–602.
. How often is bronchopneumonia overlooked as the cause of death in intensive care unit patients? (In German) Anaesthetist 2008;57:37–42.
. Discrepancies between clinical and pathological diagnosis in a polyvalent intensive care service (In Spanish). Med Intensiva 2006;30:95–100.
. Comparison of clinical and post-mortem findings in intensive care unit patients. Virchows Arch 2007;450:329–33.
. The relationship of pre mortem diagnoses and post mortem findings in a surgical intensive care unit. Crit Care Med 1999;27:299–303.
. The role of autopsy in the intensive care unit. Mayo Clin Proc 2003;78:947–50.
. Unexpected findings in trauma patients dying in the intensive care unit: results of 153 consecutive autopsies. J Am Coll Surg 2002;194:401–6.
. Findings on necropsy studies in critically ill patients. Med Intensiva 1999;23:6–9.
. Treatable abdominal pathologic conditions and unsuspected malignant neoplasms at autopsy in veterans who received mechanical ventilation. JAMA 1991;265:885–7.
. Premortem clinical diagnoses and postmortem autopsy findings: discrepancies in critically ill cancer patients. Crit Care 2007;11:R48–54.
. Discrepancies between clinical and postmortem diagnoses in critically ill patients: an observational study. Crit Care 2003;7:R129–32.
. Should we confirm our clinical diagnostic certainty by autopsies? Intensive Care Med 2001;27:1750–5.
. A triad algorithm for analysing individual ante- and post-mortem findings to improve the quality of intensive care. Anaesth Intensive Care 2011;39:1086–92.
. Comparison of premortem clinical diagnoses in critically iII patients and subsequent autopsy findings. Mayo Clin Proc 2000;75:562–7.
. Comparison between clinical and autopsy diagnoses in a cardiology hospital. Heart 2007;93:1414–19.
. Missed diagnoses in trauma patients vis-à-vis significance of autopsy. Injury 2005;36:976–83.
. Characteristics of discrepancies between clinical and autopsy diagnoses in the intensive care unit: a 5-year review. Intensive Care Med 2003;29:321–4.
. The autopsy in verifying diagnostic accuracy at the intensive care unit (In Hungarian). Orv Hetil 2001;142:2373–6.
. A study of consecutive autopsies in a medical ICU: a comparison of clinical cause of death and autopsy diagnosis. Chest 2001;119:530–6.
. Clinical diagnoses and autopsy findings; discrepancies in critically ill patients. Crit Care Med 2012;40:842–6.
. A comparison of post mortem findings with post hoc estimated clinical diagnoses of patients who die in a United Kingdom intensive care unit. Intensive Care Med 2001;27:706–10.
. Agreement between ante-mortem diagnoses, death certificates and post-mortem causes of death in critically ill patients. Clin Intensive Care 1998;9:100–4.
. ARDS: a clinicopathological confrontation. Chest 2009;135:944–9.
. Invasive fungal infection in 3447 autopsy cases Natl Med J China 1996;76:352–4.
. Postmortem cerebrospinal fluid analysis in a general intensive care unit. Indian. J Crit Care 2005;9:176–8.
. A review of the findings on chest examinations and at autopsy in surgical patients under intensive care. Fortschr Rongenstr 1976;124:427–33.
. Relationship between premortem and postmortem diagnosis in critically ill bone marrow transplantation patients. Crit Care Med 2002;30:570–3.
. Evaluation of pneumonia diagnosis in intensive care patients. Scand J Infect Dis 1999;31:299–303.
. Accuracy of clinical diagnosis of acute respiratory distress syndrome in comparison with autopsy findings. J Bras Pneumol 2007;33:423–8.
. Accuracy of clinical definitions of ventilator associated pneumonia: comparison with autopsy findings. J Crit Care 2009;25:62–8.
. Clinical diagnosis of haemodynamically significant pulmonary embolism in a coronary care unit. Cor Vasa 1985;27:337–45.
. Improving care of the critically ill: institutional and health-care system approaches. Lancet 2004;363:1314–20.
. An intervention to decrease catheter-related bloodstream infections in the ICU. N Engl J Med 2006;355:2725–32. Cancer Facts and Figures, 2010. Atlanta: American Cancer Society, 2010. http://www.cancer.org/acs/groups/content/@epidemiologysurveilance/documents/document/acspc-026238.pdf. (accessed 10 Mar 2011).
. Overestimation of clinical diagnostic performance caused by low necropsy rates. Qual Saf Health Care 2005;14:408–13.
. Prospective evaluation of early missed injuries and the role of tertiary trauma survey. J Trauma 1998;44:1000–6.
. Risk factors for the misdiagnosis of pneumothorax in the intensive care unit. Crit Care Med 1991;19:906–10.
. Blunt carotid injury. Importance of early diagnosis and anticoagulant therapy. Ann Surg 1996;223:513–22.
. Neurologic deterioration secondary to unrecognised spinal instability following trauma–a multicenter study. Spine (Phila Pa 1976) 2006;31:451–8.
. Detection and treatment of refractory status epilepticus in the intensive care unit. J Clin Neurophysiol 2008;25:181–6.
. Factors influencing discrepancies between premortem and postmortem diagnoses. JAMA 1987;258:339–44.
. Discrepancies between clinical and autopsy diagnoses: a comparison of university, community, and private autopsy practices. Am J Clin Pathol 2008;129:102–9.
. Factors associated with correct antemortem diagnosis of major pulmonary embolism. Am J Med 1982;73:822–6.
. Understanding diagnostic errors in medicine: a lesson from aviation. Qual Saf Health Care 2006;15:159–64.
. Diagnostic error in medicine: analysis of 583 physician-reported errors. Arch Intern Med 2009;169:1881–7.
. Deep venous thrombosis: clinically silent in the intensive care unit. J Crit Care 2005;20:334–40.
. Cognitive interventions to reduce diagnostic error: a narrative review. BMJ Qual Saf 2012;21:535–57.
. Virtual autopsy as an alternative to traditional medical autopsy in the intensive care unit: a prospective cohort study. Ann Intern Med 2012;156:123–30. ; Agency for Healthcare Research and Quality (AHRQ). Diagnosing diagnosis errors: lessons from a multi-institutional collaborative project. Adv Patient Saf 2005;2:255–278. http://www.ahrq.gov/downloads/pub/advances/vol2/Schiff.pdf. (accessed 10 Mar 2011). Special Emphasis Notice (SEN): AHRQ Announces Interest in Research on Diagnostic Errors in Ambulatory Care Settings. http://grants.nih.gov/grants/guide/notice-files/NOT-HS-08-002.html. (accessed 10 Mar 2011). Funding SMG was supported by an NIH training grant awarded to the Johns Hopkins University School of Medicine; DN-T was supported in part by a grant from the Agency for Healthcare Research and Quality (HS017755-01). Competing interests BWinters reports fees for expert testimony at several defense and plaintiff law firms and speaking honoraria from 3M corporation and various health systems to speak on patient safety and Rapid Response Systems. PP reports receiving grant or contract support from the Agency for Healthcare Research and Quality, the National Institutes of Health, the Robert Wood Johnson Foundation and The Commonwealth Fund for research related to measuring and improving patient safety; honoraria from various hospitals and healthcare systems and the Leigh Bureau to speak on quality and safety; consultancy with the Association for Professionals in Infection Control and Epidemiology, Inc.; and book royalties for authoring “Safe Patients, Smart Hospitals: How One Doctor's Checklist Can Help Us Change Health Care from the Inside Out.” The following authors report no conflicts of interest: JC, EC, SGK, HWL, VG, KR, AN; SMG and DN-T have no further conflicts beyond what is reported under funding.